Have you ever wished that you could fine tune the return spring force individually for each string on your MSA? Now you can! Anchors are available for both 10 and 12 string guitars. The Anchor Bracket is made from 6061-T6 Aluminum and is attached with stainless steel flathead screws. The screws go right into the existing spring screw holes in the bottom of the end plate. No drilling required. 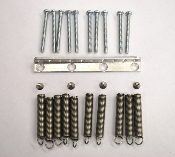 The springs are stainless steel with stainless threaded inserts and stainletss adjusting screws. This product was Designed by Darvin Willhoite.